However many cigarettes you smoke, Thrive has a great tasting, clinically proven product portfolio of discreet mint gum which can help you become smoke-free. Thrive helps to double your chances of quitting compared to will power alone. Double the chances of quitting. Be smoke-free in 12 weeks. Going on my diet caused me to smoke more. Was looking for a product to deal with the oral fixation issues dieters often develop. Bought this product to help cut down on the extra cigarettes I started smoking. It's alright if you follow the instructions, and work in a industry where you don't work face to face with customers. I felt like I should be walking around with a spittoon. 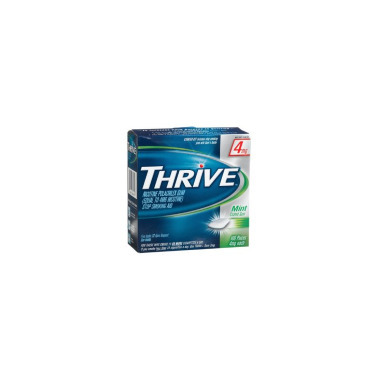 I found the thrive lozenges after I bought this product. They are much better...more discrete.